Get this from a library! 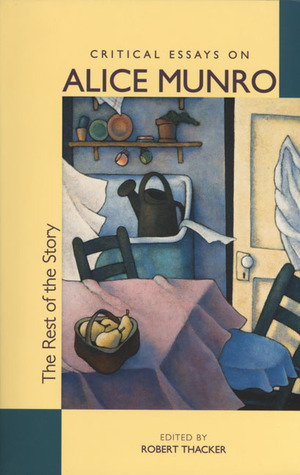 The rest of the story : critical essays on Alice Munro ; edited by Robert Thacker.. [Robert Thacker;] -- Leading critics explore the myriad connections informing Canadian author Munro's deceptively simple tales. Review of Hateship, Friendship, Courtship, Loveship, Marriage, by Alice Munro. Yale Review 90 (2002): . Redekop Magdalene. Mothers and Other Clowns: The Stories of Alice Munro. London: Routledge, 1992. Resnick Muriel. Any Wednesday. New York: Dell, 1964. The Rest of the Story: Critical Essays on Alice Munro. “'Clear Jelly': Alice Munro's Narrative Dialectics.” Probable Fictions: Alice Munro's Narrative Acts. Ed. Louis K. MacKendrick. Toronto: ECW Press, 1983. 37–60. – “Introduction: Alice Munro, Writing 'Home': 'Seeing This Trickle in Time. '” The Rest of the Story. 1–20. – ed. The Rest of the Story: Critical Essays on Alice Munro.